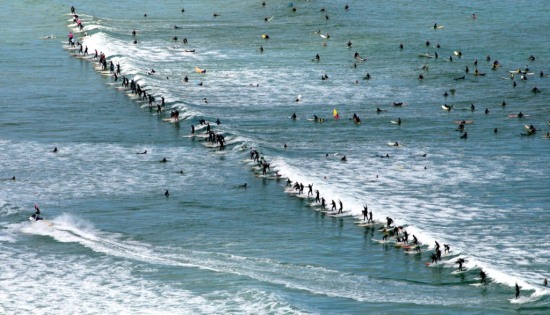 The BOS Earthwave Beach Festival, where an attempt will be made to break the Guinness World Record for the ‘most surfers riding the same wave’, will feature an exciting line-up of events in wave-riding, paddling, running and beach sports at Muizenberg on the weekend of 29 & 30 September 2012. 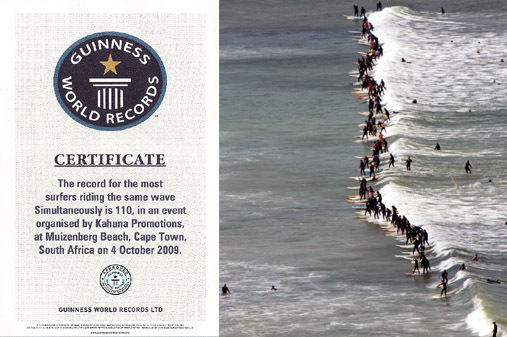 The highlight of the festival will be the attempt on the Guinness World Record and any surfer who can stand up and ride for more than 5 seconds is invited to join in to try and surpass the current record of 110 set during the 2009 Earthwave festival at Muizenberg. 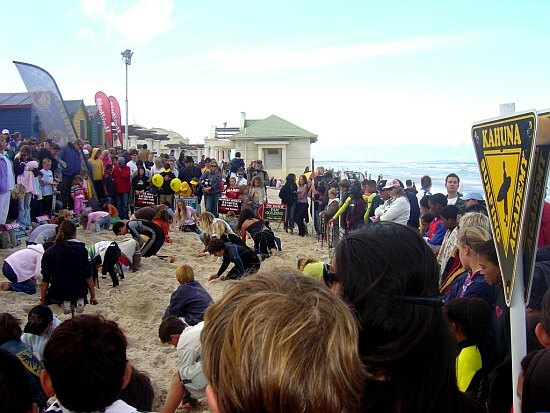 This year sees the introduction of the two-day Surf Emporium WP Inter-schools Surfing Championships which will feature the top surfers from Peninsula schools who will also compete in the Bomb Expression Session. 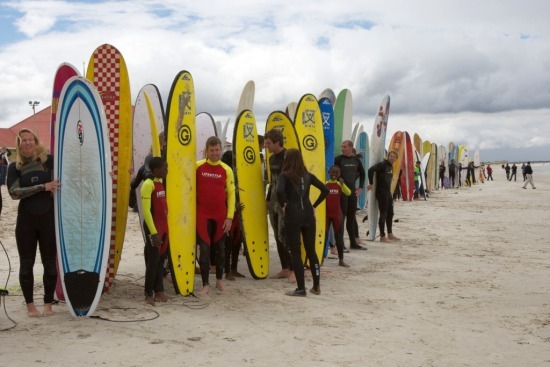 There will be plenty of action for beginners and beachgoers in the Community Surfing Initiative and Free Introductory Surf Sessions where anyone can learn how to catch and ride a wave. The country’s top longboard surfers will again be in action in the Western Province Longboard Surfing Championships, with the finals for the Open Men and Women taking place at the festival site shortly before the paddle-out for the GWR attempt. Stand Up Paddlers (SUP) will be well catered for in the inaugural Coreban SUP Races which will see paddlers racing from Muizenberg to Kalk Bay or Fish Hoek and back (weather and conditions permitting) and around-the-cans in the surfline, along with displays and the opportunity to try out the latest state-of-art equipment. Beach activities will be boosted by the running of the first ever New Balance Beach Run which is open to all athletes and follows a fast out-and-back course from Muizenberg along Strandfontein beach at low tide. Contact Top Events for further details. 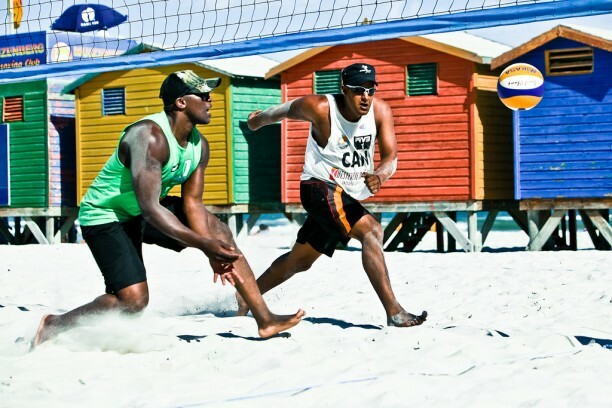 There will also be an eight-team Touch Rugby tournament organized by In2Touch, the BOS Dig For Gold where prizes totaling thousands of Rand are buried in the sand and development initiatives for those from disadvantaged backgrounds. And the action does not stop there as negotiations are in progress to stage a Beach Volleyball tournament, Skateboarding and BMX events, beach sports for children and attempts to break other Guinness World Records at the festival. All the activities at the BOS Earthwave Beach Festival take place alongside exhibitions and displays of the latest outdoor products and services with presentations by experts on environmental awareness and sustainable lifestyle choices. To stay abreast of the latest details Like the BOS Earthwave Beach Festival page on Facebook or visit www.kahunasurf.co.za for further details. The organisers can be contacted via kahunasurf@mweb.co.za for particulars on how to become part of this sustainable lifestyle initiative. See our Muizenberg images here! 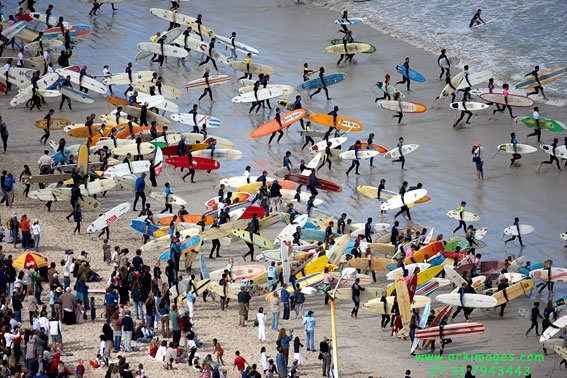 This entry was posted in Activity, Holidays and Special events and tagged Beach festival, Beach Volleyball, Earthwave Beach Festival, Guinness World Record Attempt, Longboard champs, Most Surfers on a Wave, Muizenberg, Surfing. Bookmark the permalink.